Well, it’s festival season once more. To be honest it’s probably more near the end of it now. In this recent heatwave, I’ve been really struggling with applying makeup hence why this post is up so late. In the past month I’d probably said I’ve worn makeup on 3 occasions because it just goes all horrible as soon as I apply it. Note I say 3 occasions aswell – not 3 days. I seriously couldn’t keep it on for an entire day. I recently did a little review of and some looks with Makeup Revolutions latest Sophdoesnails collaboration palette. About a week following this, they released 3 pressed glitter palettes and I fell in love once more. I couldn’t resist so I treated myself to the “Hot Pursuit” one. 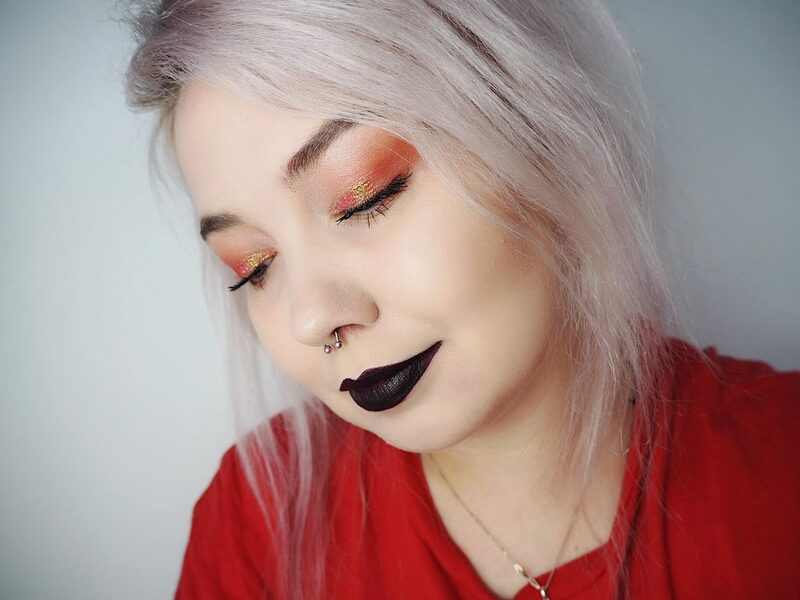 I’m all about those warm tones when it comes to makeup as I think it contrasts well with the dark fashion I tend to go for more often than not. I’ve also noticed that over the Summer my content has been leaning further away from the punky vibe it once had. Don’t get me wrong, I am absolutely adoring what I’m currently creating if I do say so myself. I do however want to put out more of the original Black Tulip vibe. So for that reason, today’s 2 festival looks are a little more alternative. They are the kind that I’d usually go for – possibly not suitable for all but I hope you enjoy nonetheless! 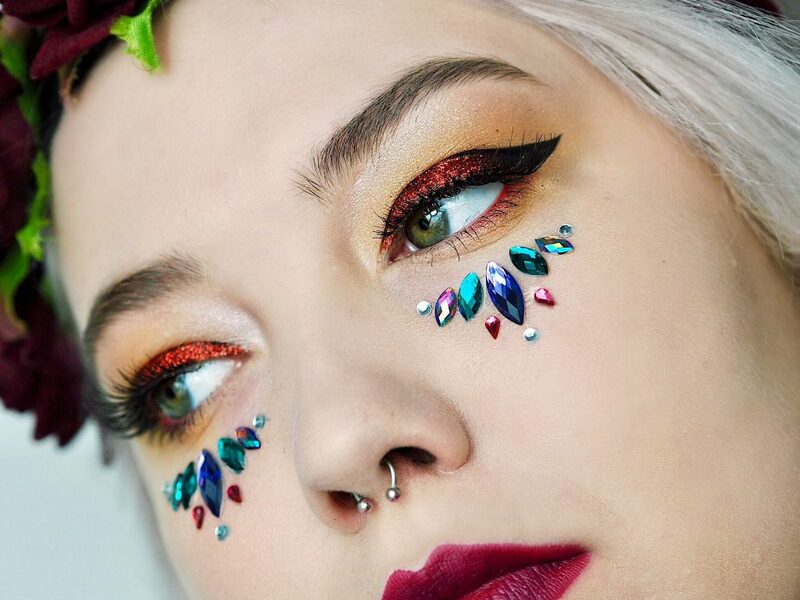 The inspiration for this look was just something for people who want a little glitz but not full on festival overload. I am personally not often an “over-the-top” kind of girl and my skin can be quite sensitive. This can sometimes make it difficult to wear certain things as it can cause a reaction for me. 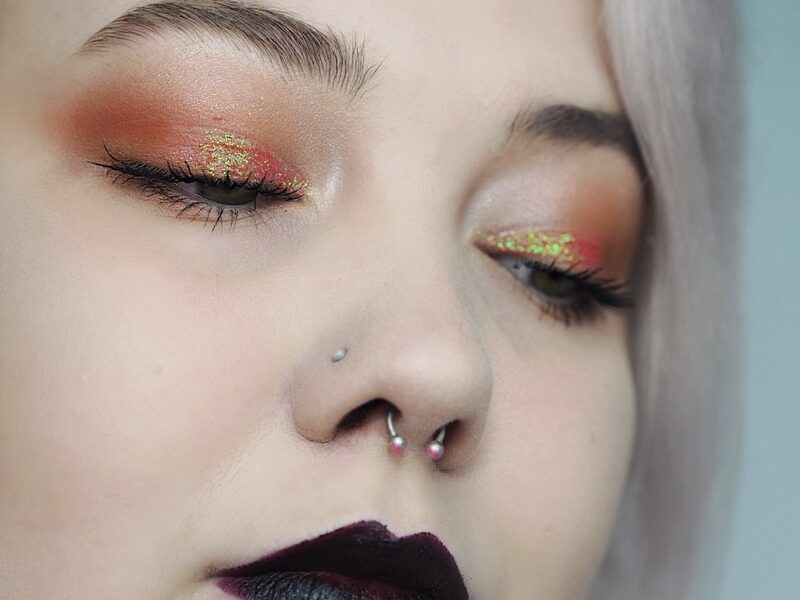 The glitter used in this look is one that is seen as either a salmony pink or a warm orange/yellow depending on which direction you’re looking at it from. I was desperate to create a look with it as soon as I saw it. It’s by far my favourite shade in the palette! 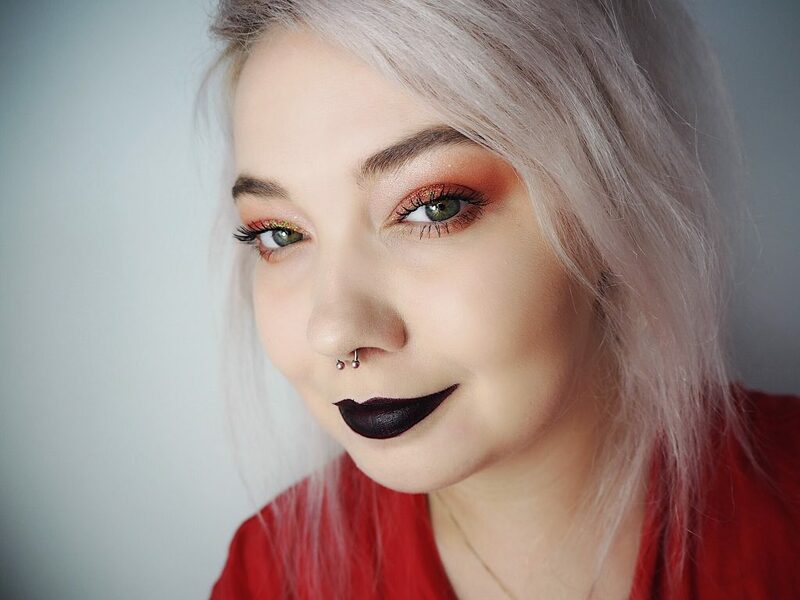 I thought pairing it with a black lip might send the look over the edge at first but I actually think the contrast is gorgeous. Who said orange and black was just for Halloween? This is probably one of my favourite looks I’ve ever created. I absolutely adore the combination of the colours black and red so the finished result pleased me greatly. 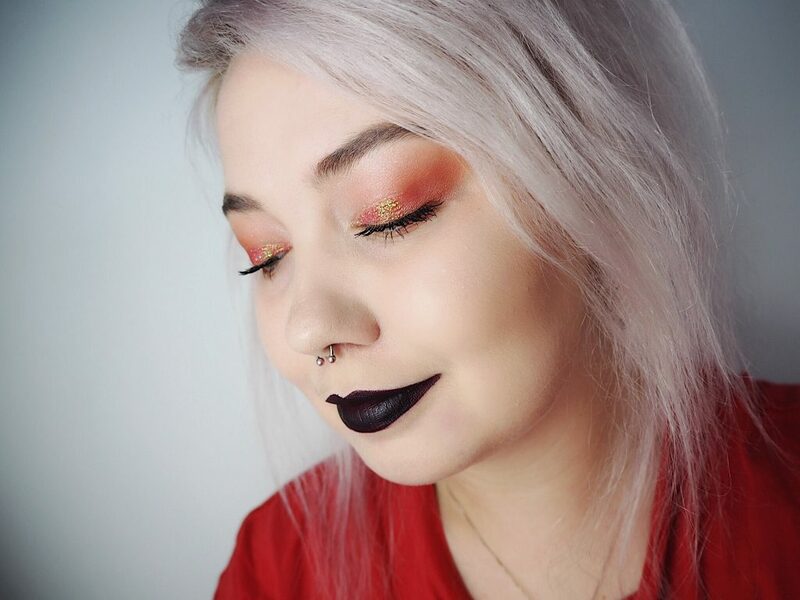 When doing this look, I applied the glitter prior to the eyeliner and in hindsight I would recommend doing it the other way around to ensure neater application. I only like putting my glitter onto the inner half of my eyelid as I’m in the hooded eye club and you wouldn’t really see it elsewhere deeming it a bit of a waste of product. 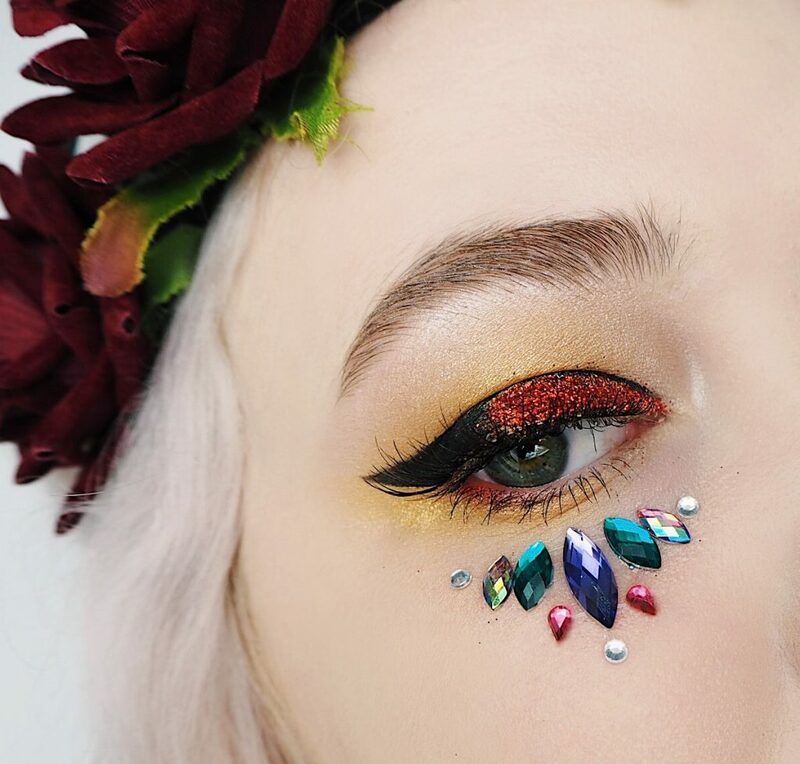 You can extend it across to however you’d like yours to look or even just put it in the very inner corner of your eyes to give it a little pop of glitter. I feel the jewels also really give it that extra festival-feel and they surprisingly didn’t irritate my face at all! For long-wear you would definitely have to use some lash glue to keep them there, though. Starting with the downfalls of it – oddly, depending on the shade, they apply differently. I’m not sure whether it’s to do with different pigments. You definitely need a decent glitter glue to make them stick as the formula of them is quite dense like all pressed glitters I’ve tried. You also cannot really swipe, you have to dab the product on otherwise it takes off the product underneath and doesn’t stick. In all honesty though, these are all the same issues I’ve experienced with literally all the pressed glitters I’ve tried. They seem like a really tricky thing to get right and I think you just have to put up with the difficulties of them to be able to get use out of and enjoy them. Either that or buy loose glitters. Solely positive things – I LOVE the pigments they’ve used in Hot Pursuit. Two or three of the colours have multiple shades running through them or have an iridescent effect. This gives them a lot more depth and more of the “wow” factor when wearing them. The palette was also only £10 meaning you’re paying £1.11 per glitter pan which is pretty damn fabulous. It’s longevity has also been brilliant with the glue I used and there was no flaking at all. It didn’t feel heavy or clumpy at all on the eye, honestly no different than a normal eyeshadow. Removing them was just as easy too, I use a hot cloth cleanser and the glitter comes off just as easy as the rest of my face. It also surprisingly doesn’t leave tiny flecks of glitter all over your face which I have annoyingly experienced with a lot of cosmetic glitters. I hope you guys have enjoyed both of my festival looks! I really enjoy experimenting with makeup when I have the time and motivation so you will see these posts every now and again. Let me know if there’s a theme or product you’d like to see on here. 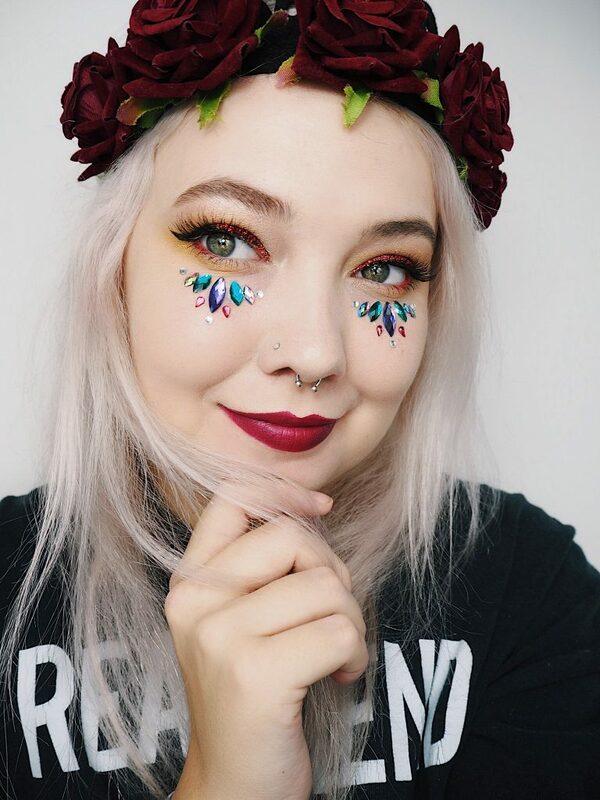 What’s your festival makeup must have? 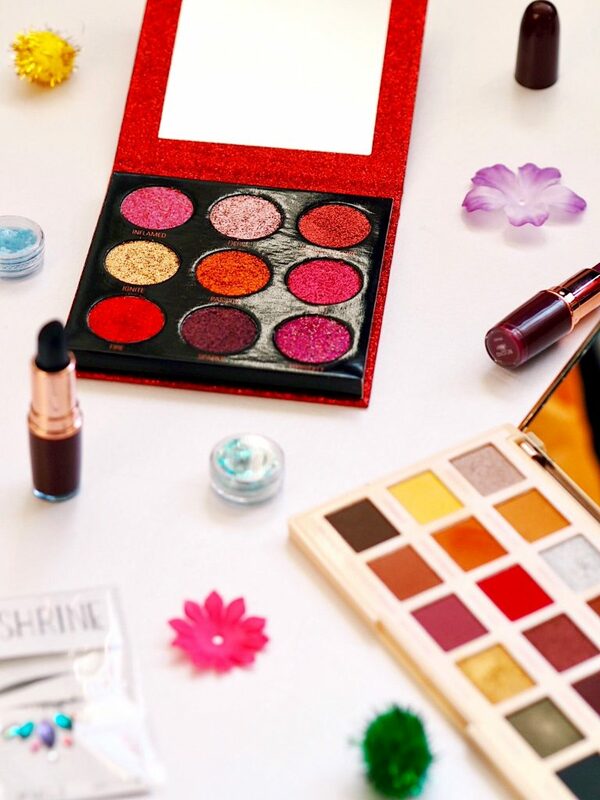 I love the looks you’ve created with this palette! Loving the alt vibe and the second look is my fave too.. I think the only issue with the palette is that some of the shades are very similar? I’m colour blind and can find it hard to differenciate shades, so I prefer a palette where the colours are completely different! Saying that, I do love a pink glitter! Both of these looks are amazing!!! But i dont really think i’d get along with pressed glitters like you said they seem kinda weird to apply so im more of a fan of loose glitters! but even still, that palette is gorgeous! Such a neat set of looks! 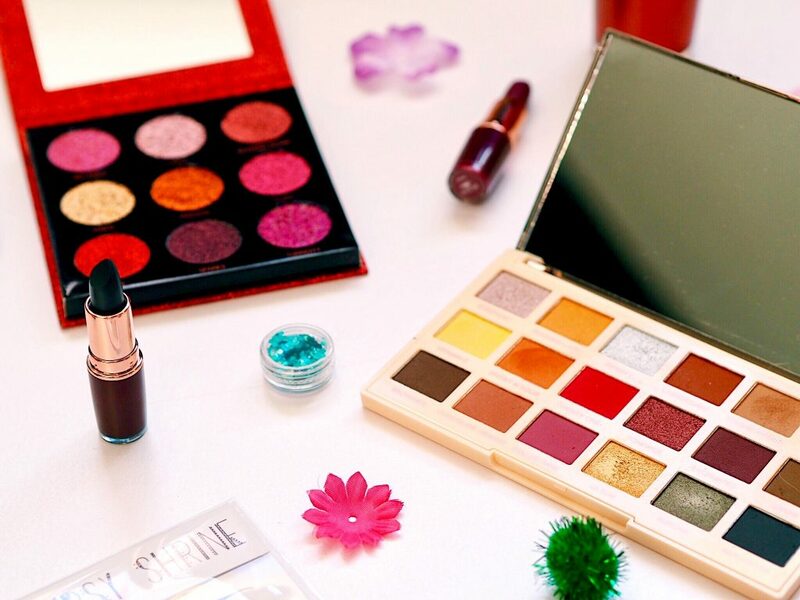 I really love some of the shades included in these palettes! I love festival season because it’s nice to see how everyone dress up for these events. 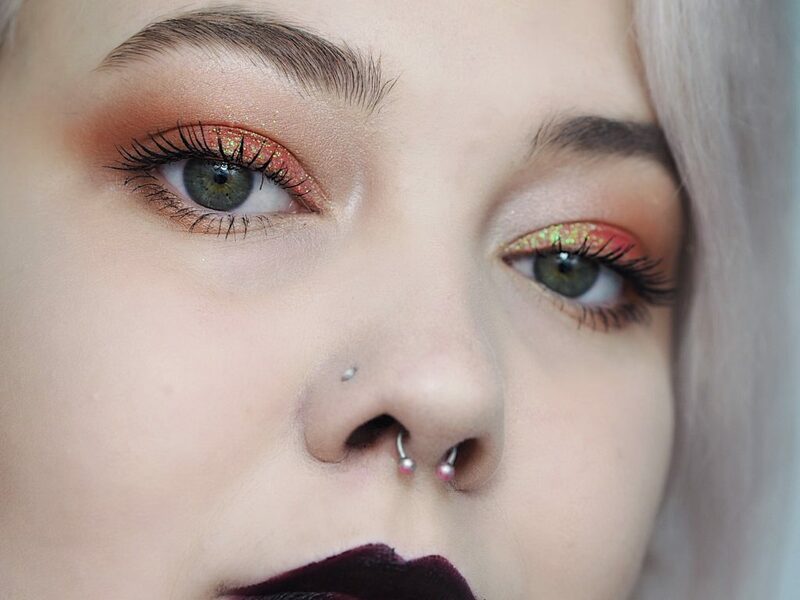 I LOVE how you do your eyeshadows! The blend is perfect and the sparkles make a big difference. I like the crystals you’ve added under your eyes. You are definitely festival ready! Hehe. 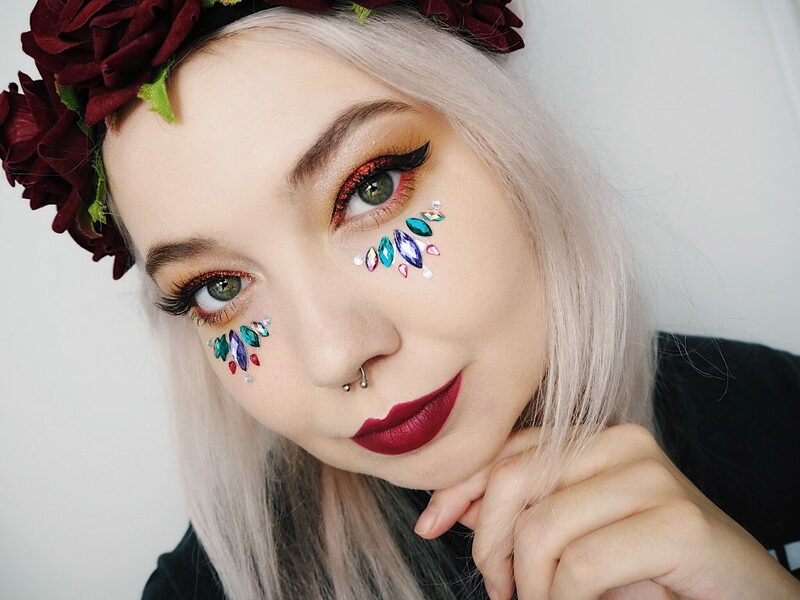 I did enjoy your festival looks – keep it up and enjoy the festivals when you go! Both looks are amazing! It is so hard to pick one! I love both to be honest even though the first one might actually be my fav! the palette looks lush! Okay firstly, your blending is absolutely FANTASTIC. Secondly, I’m so glad that I saw this as I was swatching the hot pursuit palette the other day and was so tempted to buy it! I LOVE the looks that you’ve created! I really need to buy more palettes with these shades! Wow wow wow girl you have got some skillllls! I love the goth look the most for sure! I love both looks but definitely prefer the goth look! 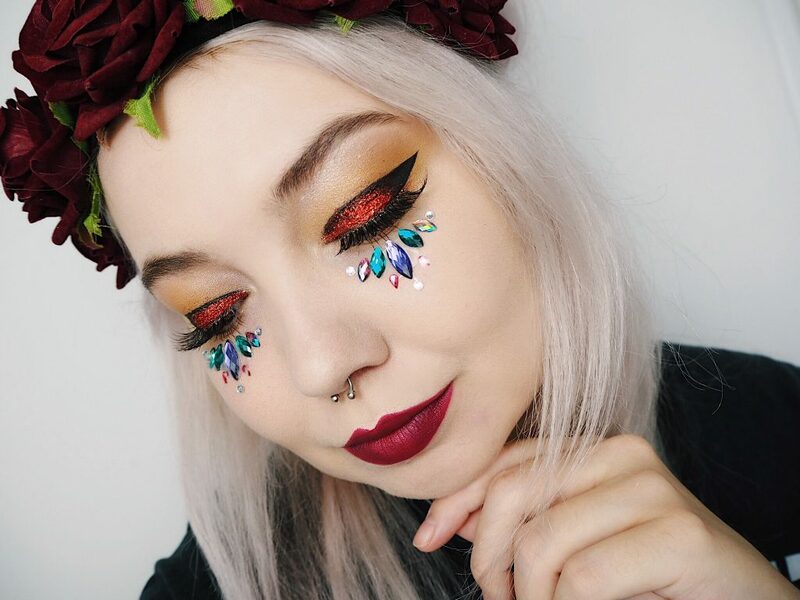 The glitter stands out so well against the black and just creates such an iconic festival look! These palettes look gorgeous in your photos, really great flatlays and looks. Loved this post! oh my goodness both of these festival looks, look amazing: but my goodness I love glitter goth, you look fabulous! I definatly need to get these eyeshadow palettles. Reolvution are making fab palettes at the moment. These looks are absolutely incredible – you look stunning! Hope you’re having a wonderful summer! These makeup looks are absolutely amazing! 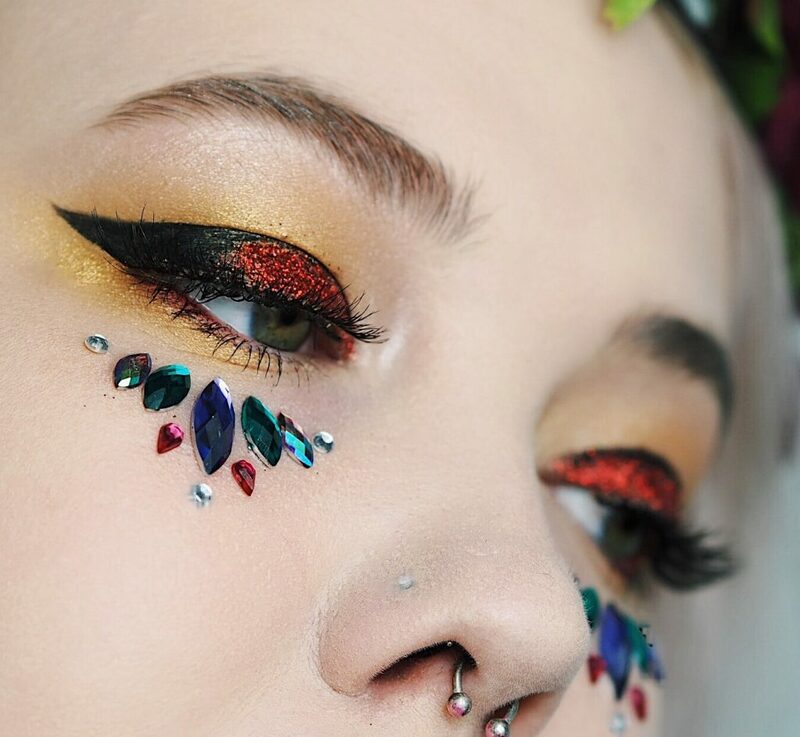 I love that you incorporate glitter and gems to your makeup because it really adds a pop. Plus, no such thing as too much glitter! I think the first look is my favorite one! 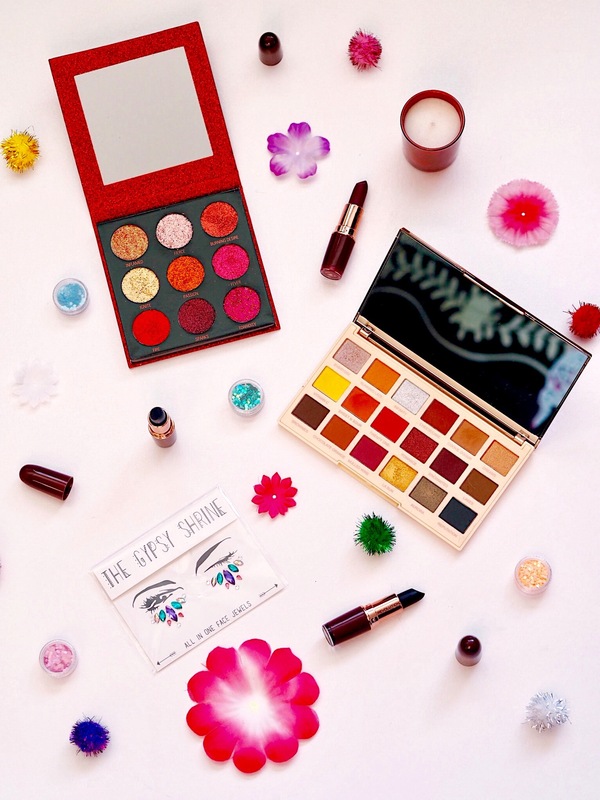 I’m not from the UK so Makeup Revolution is still kinda new to me, but I ran across it when I was looking for cheap, cruelty free makeup brands, so it’s definitely on my radar and I make lots of orders from them now! I bought 2/3 of the glitter palettes and I was no disappointed. They really are great and there’s next to no fall out with the, (and I was packing it on because there’s no such thing as too much glitter). Glitter Goth looks amazing on you. Such a unique way of using the glitter. Thanks for the inspo! These looks are INSANE girl 😍🔥 I love the second look the most! 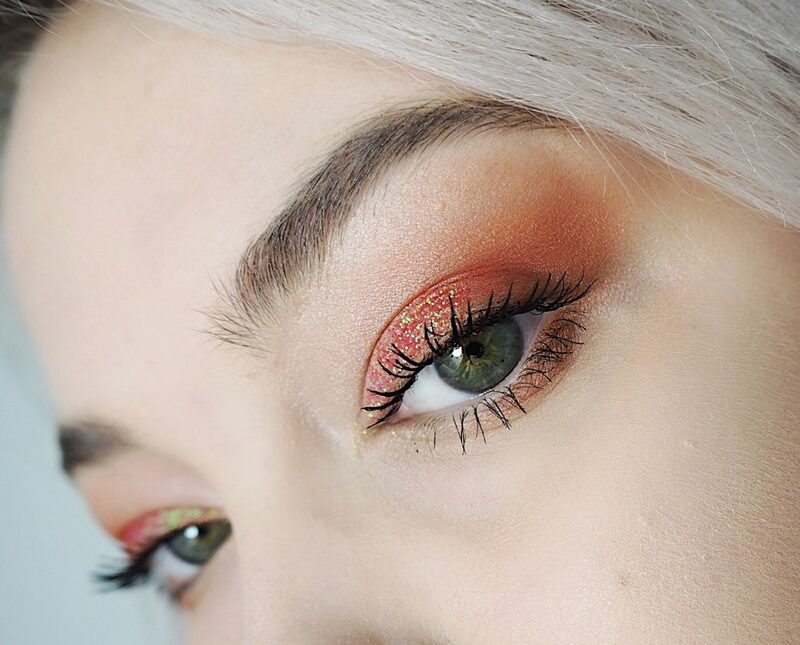 I need the sophdoesnails palette as I love her first one! For the price, those glitters look really good and would be good for someone starting off. Great review Alice, can’t wait for more makeup looks! Makeup Revolution do some amazing palettes! I love their formula too, the pigment always pays off. Firstly, I love pressed glitters. Secondly, you’re so, so, so talented! I saw these on twitter first and I was like WOW! I love the Glitter Goth and how you’ve added the jewels. Please post more beauty looks, they’re so inspiring!! Oh wow Alice, you look stunning in all of these photos! I wish I could do my make up so well because I’d be rocking that top eye look ALL THE TIME! The gems are gorgeous too, I’ve never used anything like those but really want to! I loved this review! I can definitely relate to struggling to wear makeup during the summer. A few months ago, I made the mistake of wearing black liquid lipstick to an outdoor festival, and I learned my lesson! I had a great time, but my lipstick just wasn’t up to the task, haha.